Hopedale was heartbroken. The Community’s favorite son, Adin Augustus Ballou, was dead. In the early 1850s, young Augustus was well on his way to his future. He graduated from the Bridgewater “Normal” School – a training school for teachers of the time – and began working there as an instructor, honing his skills. The hopes of his father, esteemed minister Adin Ballou, hinged on Augustus finishing his training and taking over the Hopedale Home School, a private facility created to help the Community raise much-needed funds. But within days of his triumphant presentation at the Lyceum, the young man was ill. 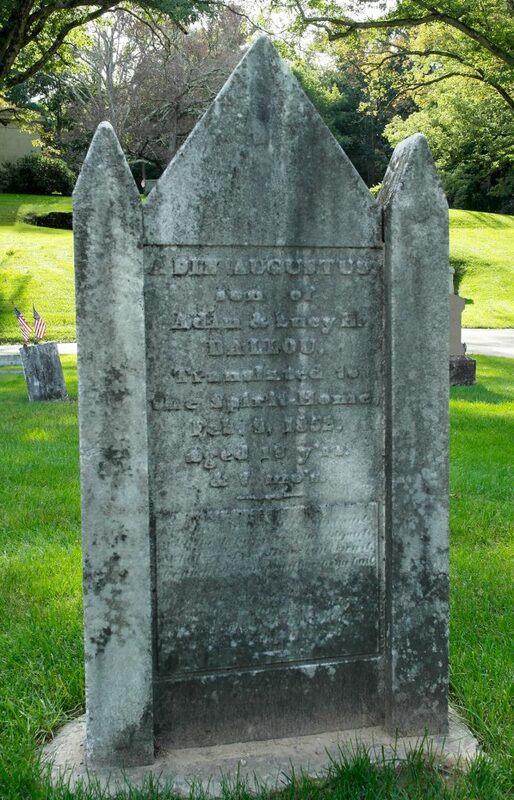 According to his father, a bout of influenza just after the holidays had “left his physical system an easy prey to the renewed onsets of disease.” Unfortunately, the disease was typhoid fever, and little could be done to save Adin Augustus Ballou. His parents rushed to bedside, spending four days nursing their son, praying in vain for his life to be spared. “They are bowed in sorrow as never before,” William Fish wrote of the couple’s pain in the town’s newspaper, The Practical Christian, but everyone was shocked at the young man’s passing. “He had pure and high aspirations within him, and noble objects before him, for the realization of which he had already marked out some of his life-plans.” Even famous abolitionist William Lloyd Garrison was stunned by the news, calling Augustus “a beautiful and most promising youth” in his paper The Liberator. For Adin Ballou, the spiritualist movement – the idea that the living can communicate with the dead – became a way to deal with his loss. Adin turned to his pen, writing two books, The Memoirs of Adin Augustus Ballou and Spirit Manifestations, in an effort to work through the death of his son. “And in tears there is relief to the overburdened heart,” he wrote. Adin Ballou turned his tears into words. Copyright 2018 The Hopedale Women's Project. All rights reserved.